We can imagine this snare will be ideal as a second snare for rock/pop but would be elevated to main snare status for reggae or ska music. Overall, it's a fantastic drum. Exceptional chrome plating. Great sound. 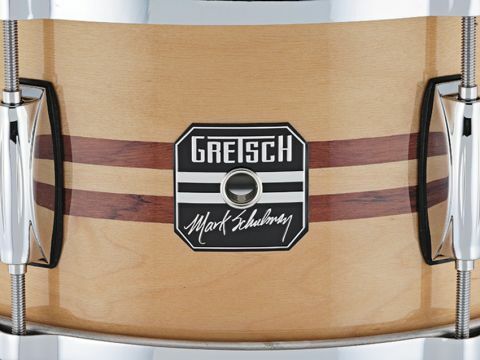 Mark Schulman (Pink, Cher, Billy Idol etc) challenged Gretsch to create a snare which "could cut through dense live performance mixes and still retain its versatility". What they have produced is a brace of Signature models in 12"x6" (as reviewed) and 13"x6" sizes. These are the latest additions to the Gretsch Full Range series, which comprises a wide and varied selection of snares, constructed from an equally wide and varied choice of materials, sizes and price points. "The chrome plating is exceptional including on the tastefully sculptured one-piece tailplane-style lug boxes and die-cast hoops." Mark's snares have similar specifications in terms of finish and materials used, with the review example having six lugs per head, whereas the larger drum boasts eight. The finish is a light natural maple featuring an inlay of two strips of a much darker Bubinga. Inside the fairly chunky 8.6mm-thick, 9-ply maple shell, we see the familiar Gretsch silver sealer and both bearing edges have been machined to 45°. As on all the quality Gretsch drums, Evans are the heads of choice. The snare mechanism is basic but effective with a steel throw-off lever and adjustable strainer encased in a die-cast case. A piece of nylon tubing over the throw-off steel chassis acts as a stop for the actuating lever. The ultra-wide 42-strand steel snare (which looks completely out of proportion to the drum), is attached at either end via nylon straps. The chrome plating is exceptional including on the tastefully sculptured one-piece tailplane-style lug boxes and die-cast hoops. Each bracket, lug box or snare component is isolated by nylon gaskets. Considering this snare is fresh from the factory, it is fairly evenly-pitched at each lug point and is still quite musical although a tad slacker than we would prefer. At this lower tension the outlandish strainer rattle appears considerable and is slackened off completely but temporarily to keep clear of the resonant head in order to bring it up to pitch. When cranked up to a concert pitch (or as near as dammit) A 440Hz, apart from a few 'cracks' as the head slides across the bearing edge, this is accepted willingly. Immediately this is transformed to a beautiful rich woody thwock and a well-aimed rim-shot produces a small arms blast that momentarily stuns, followed by a gentle and pleasing overtone. The once-annoying snare rattle has completely gone and in its place is a fat, chunky snare sound - a great contrast to the air-slicing action of this diminutive and cute drum.